Roger Pielke Jr.'s Blog: Pachauri: "I'm Not Aware of That"
The Economist: There’s another case in which grey literature, in the form of a report from a meeting organised by Munich Re, was cited in preference to peer-reviewed literature on the same subject by Roger Pielke Jr.
Dr Pachauri: Actually, that particular piece of literature had been accepted for publication in a peer reviewed journal, but then the author decided to give it to a book—which also was peer reviewed, incidentally—because he had promised the editor of that book that he would make it available. At the time when it was accessed for the IPCC it had been accepted for publication in the peer reviewed journal … We have looked into this issue and I’ve been assured that that was the sequence of incidents that took place. The Economist: In the review process on that, the authors’ response to some of the comments made by reviewers who brought up Dr Pielke’s work was that Dr Pielke had changed his mind, which he hadn’t done and they didn’t check and he had published literature that addressed exactly that point. Dr Pachauri: I’m not aware of that. This is something that I have been told for the first time. The Economist: If that were indeed the case, would you say that that was a mistake? 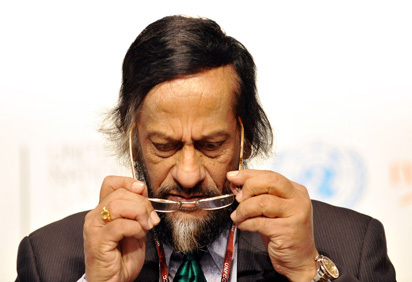 Dr Pachauri: I’ll have to look into it. I really would have nothing to say on that till I actually get into this issue. The Economist: I would be interested if you do have anything to say at a later date. For those interested in the issue involving the IPCC review misrepresentation of my views in the review process, see this post. Recent media interest has drawn attention to two so-called errors in the Fourth Assessment Report (AR4) of the IPCC, the first dealing with losses from disasters and the second on the subject of Amazon forests. The leadership of the IPCC has looked into both these instances and concluded that the challenges are without foundations. 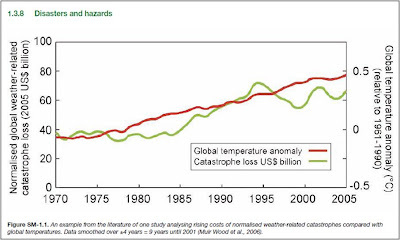 Muir Wood, R., S. Miller and A. Boissonnade, 2006: The search for trends in a global catalogue of normalized weather-related catastrophe losses. Workshop on Climate Change and Disaster Losses: Understanding and Attributing Trends and Projections. Hohenkammer, Munich, 188-194. That paper was prepared for a workshop that I co-organized in 2006. Its text can be found online here in PDF. I encourage readers to actually look at the Muir-Wood paper and see if you can find anything remotely related to the figure above. You cannot, because there is no such figure. We find insufficient evidence to claim a statistical relationship between global temperature increase and normalized catastrophe losses. I propose "Since 1970 the global normalized results do not show any statically significant correlationn with global temperatures." and to remove the end of the paragraph and the figure 1,5 because it can mislead a reader not familiar with correlation. "We find insufficient evidence to claim a statistical relationship between global temperature increase and normalized catastrophe losses." 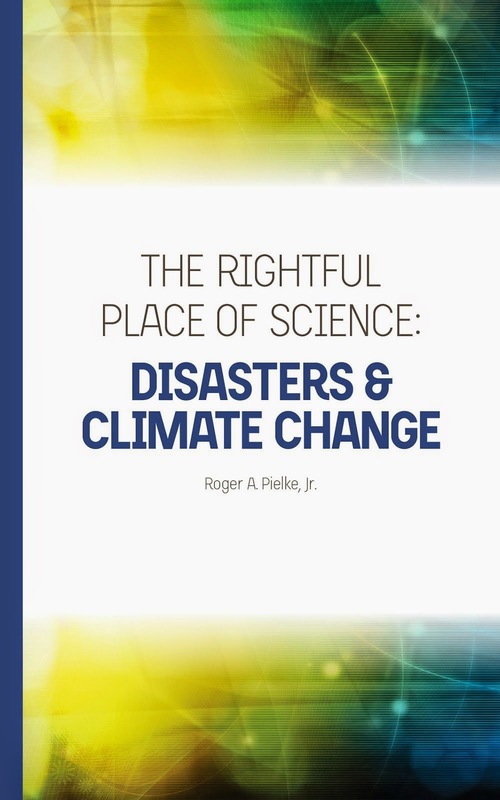 The bottom line is that the IPCC indicated a relationship between increasing temperatures and the rising costs of disasters when no such relationship has been found in the literature -- in that literature cited by the IPCC or otherwise. This issue is not nuanced; it is not clouded by ambiguity. Like the Economist, I look forward to hearing Dr. Pachauri's reactions when fully informed. Meantime, do read the Economist interview in full, the exchange on glaciers is interesting to say the least.